Search Results for "child model"
Happy kid playing with mother and toy airplane outdoors. 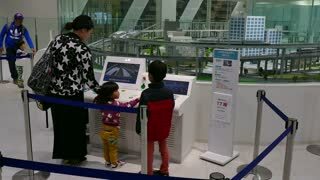 The child is playing an airplane model with his mother. An adorable child model is catching orange autumn leaves as they fall from the trees and cover the green grass. A child model smiling and playing with her toy Bunny and a large green field with beautiful autumn leaves on the trees behind her. Filmed in UHD 4K. A female child model smiles at the camera and begins running towards us as the sun shines brightly behind her in an upper-class neighborhood. An adorable child model is catching orange autumn leaves as they fall from the trees and cover the green grass. Filmed in UHD 4K. A cute child model swings on a rope on an obstacle course that is made out of wood she smiles at the camera and continues walking. A child model smiling and playing with her toy Bunny and a large green field with beautiful autumn leaves on the trees behind her. A female child model smiles at the camera and begins running towards us as the sun shines brightly behind her in an upper-class neighborhood. Filmed in UHD 4K. A cute child model swings on a rope on an obstacle course that is made out of wood she smiles at the camera and continues walking. Filmed in glorious 4K. A model of a sailboat. Father and daughter. A child holds a model of the ship in her hands. Backlight. Silhouettes of people against the sky and sun.